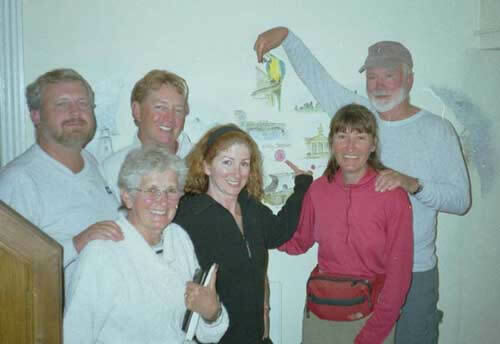 “The Rovers” is the family group that walked across England (along it’s famous trail called the “Coast to Coast”, aka the “C2C”) in September of 2002, and consists of Phil Hough (Nowhere Man), Deb Hunsicker (Walking Carrot, or sometimes simply The Carrot), Bob Hough (Wrinkled Warrior), Joann Hough (Gypsy Jo), Trisha Miller (Red Rover), and Rod Neal (Lightning Rod). In the beginning there was Bob and Joann. They begat an eldest child and only son, Phil. Later they begat an eldest daughter formerly known as Patricia, now called simply “Trisha.” At some later point they had two other daughters who are not relevant to this story because they did not walk “the walk.” Of course, they are still relevant to their parents……..but that’s another chapter in another story.